We were in Stuart this morning shooting video at Martin Health Systems (Martin Memorial) for a Business Development Board of Martin County video. It was a great day for the exterior videography. 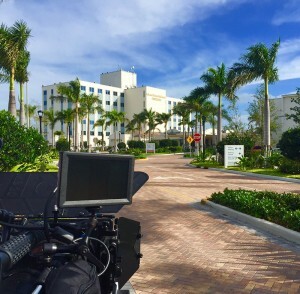 We were contracted to produce a 3 minute promotional video positioning Stuart, Palm City, Indiantown and all of Martin County as a great place to expand or relocate a business. This has been a great video project to be involved in – requiring us to shoot in all corners of Martin County. We are moving in to post production/editing and will have things wrapped in the next couple of weeks.